Nicodemus and Joseph of Arimathea apparently believed in Jesus, so what happened to the Jewish religious leaders after they placed their trust in Christ? We are introduced to Nicodemus in the Gospel of John chapter 3 and John is the only record we have of Nicodemus, as the other three gospels remain silent about Nicodemus. Nicodemus was a Pharisee and the Pharisees, unlike the Sadducees, believed in the resurrection, but were also responsible for a high level of legalism, so Nicodemus was not only a ruler, he was a member of the Sanhedrin, which was the ruling body of the Jews, but why is John the only one who writes about Nicodemus? Perhaps the other gospel writers were protecting Nicodemus because it appears that he later believed in Christ. There is no other reason for Nicodemus to have come with Joseph of Arimathea to retrieve Jesus’ body and prepare His body for burial. Before Nicodemus’ conversion, John writes, “Now there was a man of the Pharisees, named Nicodemus, a ruler of the Jews; this man came to Jesus by night and said to Him, ‘Rabbi, we know that You have come from God as a teacher; for no one can do these signs that You do unless God is with him’” (John 3:1-2). Nicodemus was not just a Pharisee, but a ruler of the Pharisees, which was one of the most powerful positions to hold in Jewry. He came at night, perhaps not wanting it known that he met with Jesus. It is possible he was sent by the Pharisees to find out more about Jesus, as this took place early in His ministry. Nicodemus himself might have wanted to know if Jesus was the Messiah. Only God knows, but after Jesus’ death, Nicodemus would later come and take His dead body and prepare it for burial, using “a mixture of myrrh and aloes, about a hundred pounds weight. So they took the body of Jesus and bound it in linen wrappings with the spices, as is the burial custom of the Jews.” (John 19:39-40). Joseph of Arimathea was with Nicodemus. After Jesus death, we see Nicodemus and Joseph of Arimathea specifically, asking “Pilate that he might take away the body of Jesus; and Pilate granted permission. So he came and took away His body” (John 19:38b), but one thing we know for sure is, Joseph of Arimathea was “a disciple of Jesus, but a secret one for fear of the Jews” (John 19:38a), and since Nicodemus was also with Joseph, he also, believed in the Lord…perhaps secretly as Joseph had a “fear of the Jews.” Mark gives us a bit more about Joseph of Arimathea than does John, as Mark writes that “Joseph of Arimathea came, a prominent member of the Council, who himself was waiting for the kingdom of God; and he gathered up courage and went in before Pilate, and asked for the body of Jesus” (Mark 15:43). We have God’s Word on the authenticity of Joseph’s conversion, as Matthew writes “there came a rich man from Arimathea, named Joseph, who himself had also become a disciple of Jesus” (Matt 27:57). “Jesus told his disciples, ‘If anyone would come after me, let him deny himself and take up his cross and follow me’” (Matt 16:24) and said, “A disciple is not above his teacher, but everyone when he is fully trained will be like his teacher” (Luke 6:40), and those who are like Christ will suffer persecution like Christ, although not to the same extent of course. This means, “If anyone comes to me and does not hate his own father and mother and wife and children and brothers and sisters, yes, and even his own life, he cannot be my disciple” (Luke 14:26), and “Whoever does not bear his own cross and come after me cannot be my disciple” (Luke 14:27), so every Christian should know, if they don’t already, that the narrow path to eternal life is difficult, and few will find it (Matt 7:13-14), “So therefore, any one of you who does not renounce all that he has cannot be my disciple” (Luke 14:33). By the time Nicodemus and Joseph of Arimathea had died, they had surely found this out. 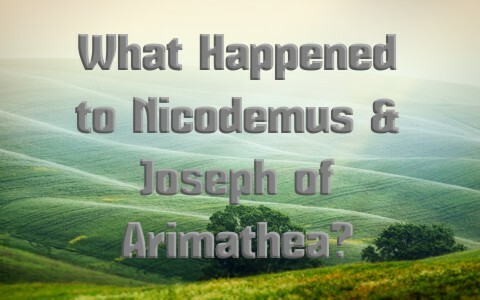 What Happened to Joseph and Nicodemus? Sources outside of the Bible, as we know, are unreliable at times, but the Gospel of Nicodemus, as well as other apocryphal works, indicated that Nicodemus lost his position as a Pharisee and was kicked off the Sanhedrin, and was eventually banished from Jerusalem by the hostile Jews. My seminary professor told us that he believed Nicodemus was saved early, even before Calvary, and was later baptized by the Apostle’s Peter and John, although he acknowledged that it’s impossible to prove. Further, he said that Nicodemus remains were said to be found in a common grave along with those of Gamaliel and Stephen. Again, this cannot be known for certain. It is possible, Joseph of Arimathea fulfilled Isaiah 53:9 where it was told that the “suffering servant,” Jesus Christ, “made his grave with the wicked and with a rich man in his death, although he had done no violence, and there was no deceit in his mouth.” This was fulfilled, probably unknowingly, when Joseph gave his own burial site for Jesus to be laid, perhaps indicating Joseph was well advanced in years. To be sure, we just don’t know what happened to Nicodemus and Joseph of Arimathea, but I believe we will see them both in the kingdom, because they showed by their actions that they revered the dead body of Jesus and wanted to give His body a proper and decent and honorable burial. No enemy of Christ would take such a risk for fear of being exposed by the Jews. In fact, no enemy of Christ would even care what happened to Jesus’ body after He died. Joseph derived his name, Joseph of Arimathea, from the Judean city from which he came and Nicodemus was very much like Paul, a Pharisee of the Pharisees, a member of the Sanhedrin. Both men had power, wealth, and influence, but they were willing to lose that for the purpose of receiving eternal life and being born again. Just as Jesus said, “Truly, truly, I say to you, unless one is born again he cannot see the kingdom of God” (John 3:3), and there is strong reason to believe these two men were just that; born again. Nicodemus tried to fight for justice when the Jews were using illegal tactics to try Jesus (John 7:50-51), but to no avail, so I believe we will see these two men in the kingdom, and maybe then, we can get all these questions answered and satisfy our curiosity. Read some more background here: Who Were the Pharisees and the Sadducees? Apart from attending one of our Lord and Master’s sermons out of curiosity, can you think of any other plausible way in which Joseph of Arimathea became a convert to Christianity and thereby a secret disciple? Great question sir, but we know that since Joseph asked for Jesus’ body to bury Him, everyone must have known that he was now a disciple of Jesus. Otherwise, they would not have wanted anyone to know they were His disciples, but to do this publically shows Joseph was no longer a “secret disciple” but was one publically. I pray this has helped sir. Previous post: What Is A Reprobate Mind? Next post: Why Do Churches Close Or Die?